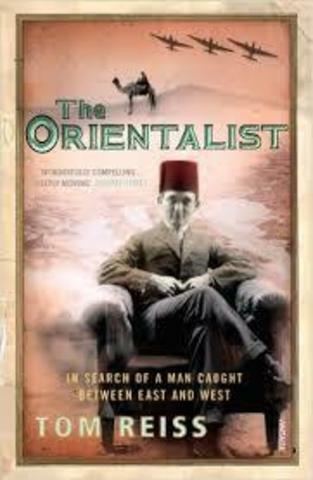 The Orientalist unravels the mysterious life of a man born on the border between West and East, a Jewish man with a passion for the Arab world. Tom Reiss first came across the man who called himself 'Kurban Said' when he went to the ex-USSR to research the oil business on the Caspian Sea, and discovered a novel instead. Written on the eve of the Second World War, Ali and Nino is a captivating love story set in the glamorous city of Baku, Azerbaijan's capital. The novel's depiction of a lost cosmopolitan society is enthralling, but equally intriguing is the identity of the man who wrote it. Who was its supposed author? And why was he so forgotten that no one could agree on the simplest facts about him? For five years, Reiss tracked Lev Nussimbaum, alias Kurban Said, from a wealthy Jewish childhood in Baku, to a romantic adolescence in Persia on the run from the Bolsheviks, and an exile in Berlin as bestselling author and self-proclaimed Muslim prince. The result is a thoroughly unexpected picture of the twentieth-century - of the origins of our ideas about race and religious self-definition, and of the roots of modern fanaticism.